A wedding day is a most awaited day in a girl’s entire existence. Every girl wishes to look her best on this day as it marks the beginning of her new life. So, be it a wedding, festival or some other event, everything has its uniqueness. 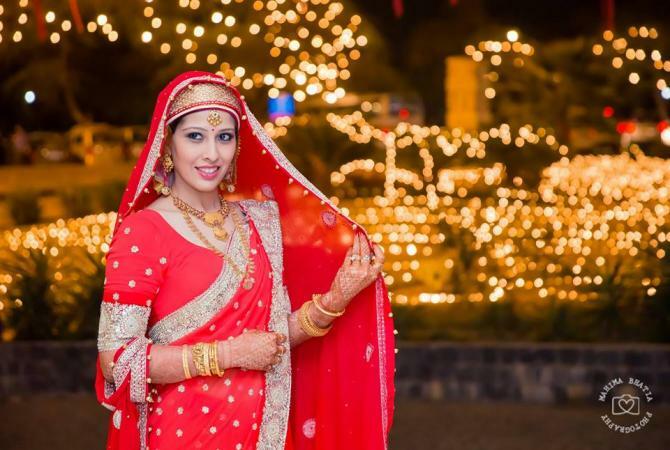 Indian brides differ from culture to region to religion and it is because India is a diverse country which is rich in culture and beholds many religions with different values and customs. That is why there are so many Indian bridal looks in our country from Kashmir to South. 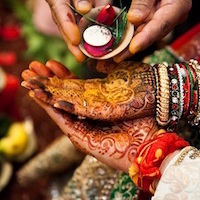 In India, wedding is not just about celebrating the union of two individuals, but rather it is a promise to be with that person not only in this life but for the next seven lives or for Saat Janam. In India, weddings are usually a large affair where you can see brides flaunting their best looks. 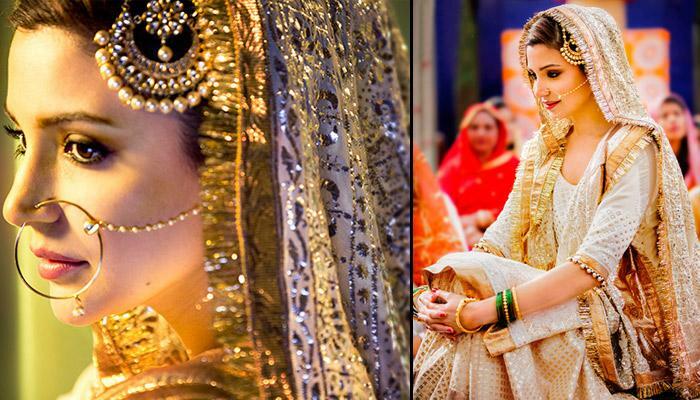 So, here we present some Indian bridal looks for you that will leave you awestruck. 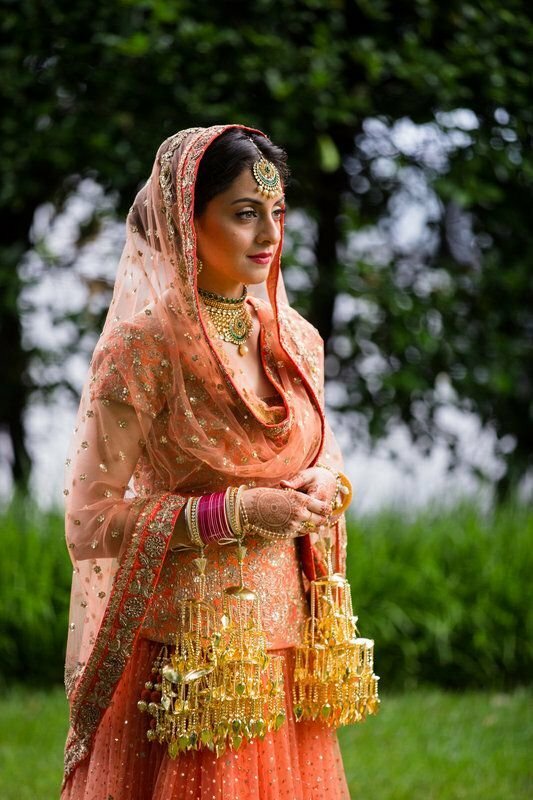 A Sikh bride can wear either a lehenga or anarkali suit for Anand Karaj ceremony. No matter how many jewels and gems a Sikh bride wears, but her look is never complete without chooda and kalire. Her chooda comprises of white, red, pink bangles which are given to the bride by her maternal uncle and aunt. The kalire are bright golden or silver trinkets which are tied on bride’s chooda by her maternal uncle. The bride covers her head with a veil during the entire wedding ceremony. Well, who hasn’t heard about the big fat Punjabi weddings? I am sure everyone has because they are so grand and lavish. Similarly, the Punjabi bride’s lehengas are grand and heavy with lots of glitters and embroidery. Usually, they are pink, red and maroon in colour; however, white and black are avoided. Punjabi brides lehengas are to die for. They are usually teamed with gold and diamond jewellery. Nose ring or nath forms an integral part of the jewellery. Indian Christians have certain cultures different from others depending on their region. Not all Christian brides wear a white dress on their wedding day, some prefer to wear sarees. However, those who opt for wearing a white dress have a net veil supported by a tiara, a white flower bouquet and a traditional practice of bride walking down the aisle in the church with her father. The Muslim bride usually wears a bright red or yellow ghaagra, a heavily pleated skirt with a long blouse embroidered in gold. The dupatta is hung low, covering her bowed head. The most notable thing in brides attire is her jewellery especially the jhoomar. A silk cloth is tied on her wrist wrapping the silver or gold coin given by groom’s mother before the wedding. A Muslim brides eye makeup is something to die for. The fineness of the kajal makes her look more and more beautiful. As per the Assamese culture and tradition, the bride has to wear the mekhela chadar, a traditional bridal outfit given by groom’s mother. It is a silk saree with gold work and is cream or off-white in colour. She wears traditional jewellery, and maang tikka is considered as auspicious. Brides do not wear heavy makeup. The Tamilian bride wears a bright coloured kanjeevaram saree with zari border. Bride’s hair is tied in a braid which is then decorated with traditional gold jewellery. Their head is completely decorated with gold jewellery comprising of single string maang tikka and matha patti and long earrings. Bengali brides usually wear a white or off-white benarasi silk sarees with zari work and red or maroon borders. Alta is a major part of her makeup. It is applied on her feet. She wears a maang tikka supported by a single matha patti. White and red dots of sandalwood paste are painted in the area above her eyebrows. 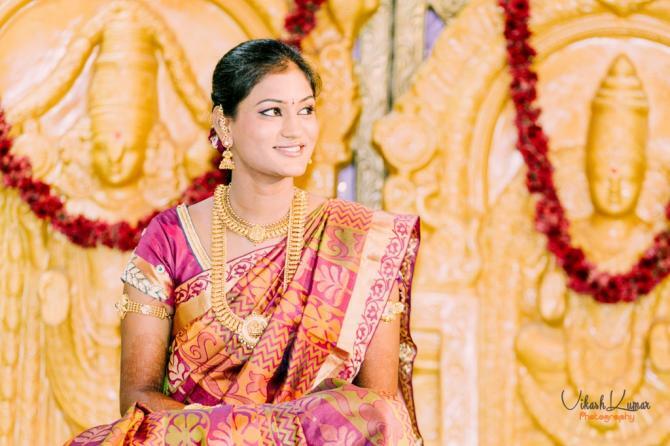 The Telugu bride changes into two bridal looks during her wedding ceremony. She wears a silk saree with all the jewellery and kamarbandh when she is brought in a tokri by her brother and maternal uncle, and for the jeelakarra bellam ceremony, she changes into white cotton saree with red border. A Marwari bride wears a heavy lehenga or a saree with gold or silk work. Just like her outfit, her jewellery is also heavy. 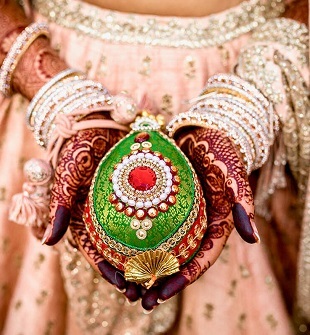 Borla- a fingerlet; a kundan- a neckpiece and gold nath are the most important jewellery for a Marwari bride. A string of flowers or pearls called mundavalya differentiates Maharashtrian bridal look from other Indian bridal looks. Her saree is a double tone silk saree with golden border called paithani, which she wears in a dhoti style. She ties her hair in a bun with mogra flowers. Unlike other Indian bridal looks, Gujarati bridal look is very different. Gujarati bride wears her pallu facing the front. She wears two Sarees during her wedding ceremony a panetar and gharchola. Panetar is a white saree with red, golden, green dots. It is the last gift from her parents and relatives side. Gharchola is a bright red saree with a silk and zari work given by her in-laws symbolising their acceptance of her as their daughter-in-law. For the wedding, Malayali brides are dressed up in white silk sarees with golden borders. They prefer flowers jewellery to compliment their outfit which includes gajra, jasmine and rajanigandha flowers. Among the entire Indian bridal looks, Kashmiri bridal look is my favourite. The traditional outfit turns them into ethereal beauties. It involves a pheran, which is a raffle outlined with an ari or snare embroidery at the neck, sleeve and edges; it can be in red, yellow and pink shading. The headwear includes kalpush alongside zoojh (a white shading fabric with brilliant golden paper), and large the whole thing is called Tarang. The bride either wears a saree or lehenga and dupatta is worn over the head. 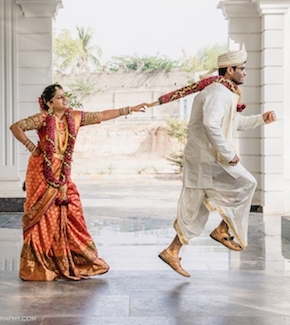 Andhra bride usually keeps their attire very simple. They wear a silk saree with checkered and patterned work. In jewellery, they wear a neckpiece, earrings and bajubandh. An Oriya bride wears a heavy lehenga or saree with hand work usually red, maroon or magenta in colour. The couple wears a traditional headgear during their wedding. So, these were some of the different kinds of Indian bridal looks from all over India. These brides symbolise the mixture of different traditions and culture that our country beholds.